Can chickens go outside in winter? Yes! The truth is, they like to get outside and explore in pretty much any weather and it’s always good for them to get some fresh air. It’s important to understand that chickens are equipped to handle cold weather. In fact, it can be easier for them to withstand cold weather than hot weather. As you know, backyard chickens have lots of feathers and they’re there for a reason. Underneath their outer feathers, chickens have a downy layer of soft feathers. When it’s cold, they fluff those feathers to trap warm air underneath and they’re able to stay cozy. The biggest danger chickens have to worry about is their extremities. Chickens do have an adaptation called rete mirable or "wonderful net" that helps regulate the temperature in the legs and feet by exchanging hot blood from the heart with the veins carrying cold blood to the feet and legs. This keeps them pretty safe unless they are allowed prolonged exposure to extreme cold and wet conditions. Make sure that chickens always have a warm, dry place to roost. Check on them often, especially birds that have feathered legs and feet. The feathers can get wet, freeze and cause frostbite. While they may be pretty, the combs and wattles on roosters become a liability in winter. In breeds, like leghorns, both the males and females have large combs and wattles that are susceptible to frostbite. For good measure, I cover the combs and wattles of all the birds in my flock with a layer of petroleum jelly for extra protection and I check often to reapply and look for signs of damage. I also like to raise my water containers during cold weather to help my roosters keep their wattles from dangling in their water. It’s unavoidable, but I try to minimize it because roosters can often suffer great damage as their wet wattles hang down when they're drinking, get wet and freeze. I know lots of chicken owners open their big coop door during the day and let their chickens free range. But on cold days, this may not be a wise choice. When it's a really cold or bad weather day, I only open the small pop door that leads to my run. The run has a big door where the chickens can exit to the wide outdoors and this keeps the main coop closed and warmer. If you've got evergreen trees or bushes around the yard, you'll notice that the ground underneath them often stays more clear of snow than other exposed areas. Make sure the chickens have access to these naturally snow-free areas. You'll find they spend a lot of time in those places. Our run is attached to the coop and has a formal roof. This keeps snow out and allows the chickens to have a place free of snow to roam. In years past when I didn't have a roof on the run, I’ve put a tarp over the run and some tarps on the sides of the run to keep out the blowing snow and wind. I'm usually pretty creative with things that are on hand around the house. Whatever it takes to make a dry enclosed area! While a dry run is great, my backyard chickens are used to roaming. So, I give them wide patches of lawn that are free of snow. Here’s how I accomplish this task. I take anything I can find like an old baby pool and pieces of plywood and lay them down before the snow starts. Once it's done snowing and time for my chickens to go outside, I reach under the snow and lift up the boards. Voila! Fresh grass and a dry place to scratch! If the snow gets too deep, it can be impossible to lift all the boards and baby pools I’ve placed on the lawn. That’s when I get out the shovel, for my chickens and for me. I try to make paths for everyone move around easily and make paths to sheltered spots like the deck. That way my chickens don’t have to wander aimlessly. They can go to a safe spot that’s free of snow. I've found chickens are smart and they diligently follow those paths. If your flock has to stay inside more during the inclement weather, it's easy to keep them occupied; an essential to preventing bad behavior. The major chicken food companies all have their version of a flock block. It looks a little like a salt or mineral block you'd put out on the farm, only this block is stuffed with all kinds of goodies that chickens love. I buy a block at the feed store and put it in the coop. To keep it clean and out of the bedding, I put the block on a big flower pot saucer and then let the chickens peck away. They love it! I like to buy an extra cabbage or two at the grocery. I drill a hole through the center and then string it from the ceiling of the coop. The trick is to put the cabbage high, but not too high. The chickens love the fresh greens and spend tons of time hopping up and down to grab pieces of the cabbage. It's hilarious to watch and a great activity for the chickens. Spreading a thick layer of straw on the floor of the coop can do wonders for keeping chickens warm. But why spread it yourself. Simply throw the bale into the coop and break it into large blocks around the coop. Your chickens will do the spreading and have a ball doing it. Plus they may find some leftover seeds as a bonus. Tip: Do be careful with straw. It can harbor chicken pests like mites. Be sure to check your chickens throughout the winter to make sure they are healthy and pest free. Spread their feathers to look down at the skin, especially by the vent and under the wings. Mites are small, but you can see them moving on the skin. Treat accordingly if you do see signs of infestation. No matter what methods you choose, it's possible to let your chickens roam during the winter. They'll be happier for it and so will you. 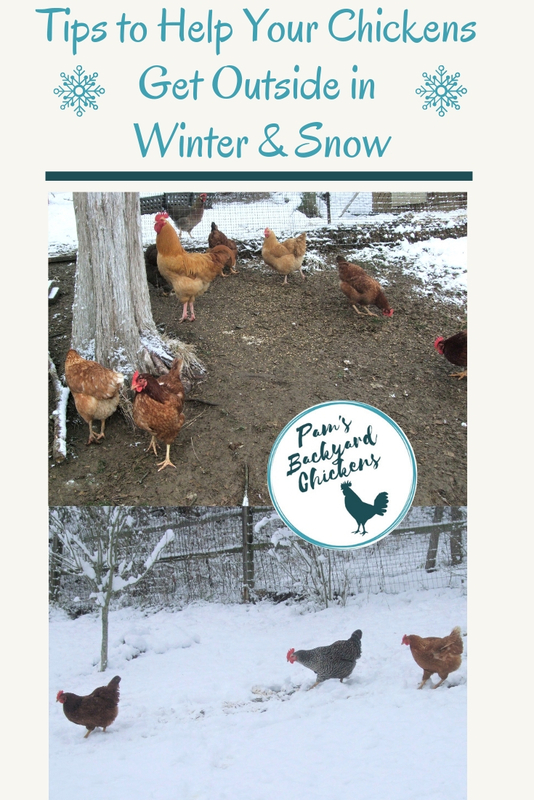 Do you let your chickens explore in the winter? In the snow? What do you do to help them get outside?